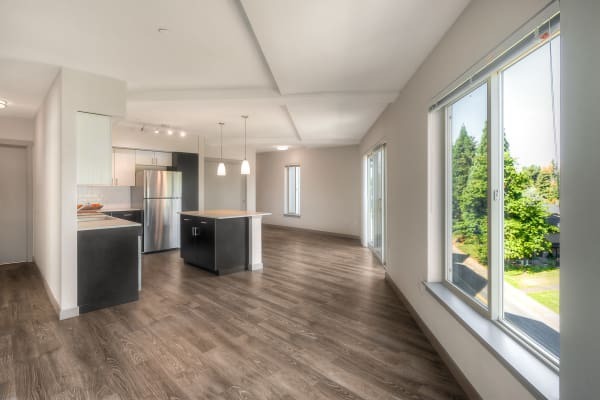 At Tria Apartments in Newcastle, Washington, you can choose from 11 modern and sophisticated floor plans, depending on your needs. Choose from six one bedroom floor plans that are up to to 732 square feet. One bedroom apartments with a den come with two bathrooms and cover 979 square feet. Our two bedroom apartment floor plan features two bathrooms and 988 square feet. Or you could choose a two bedroom apartment with a den that comes with two bathrooms and boasts 1,213 square feet. As soon as you walk through your new front door, you’ll feel the difference at Tria Apartments. Your new one or two bedroom apartment comes with the luxurious features you would choose for yourself. 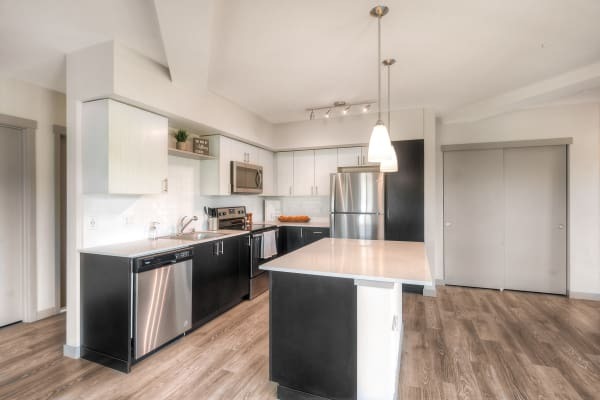 Hardwood flooring leads into the bright and spacious kitchen, fully equipped with sleek stainless-steel appliances. Your in-home washer and dryer makes laundry day quick and convenient. When the clothes are clean, hang them up in your enormous walk-in closet. Our floor plans have something for everyone. Schedule a tour with our friendly management team today to see our one and two bedroom apartments for rent in Newcastle, WA.